The head of the Environmental Protection Agency announced today that the best scientists in the country won’t be able to advise the agency on environmental science. 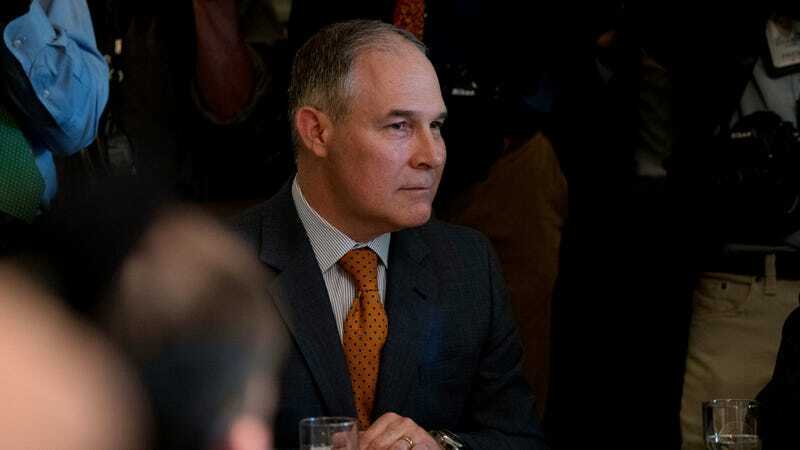 “Never before in almost 40 years of functioning of Scientific Advisory Boards has it been deemed necessary to restrict individuals with EPA grants from serving,” Genna Reed, an analyst with the Union of Concerned Scientists, told Earther. The agency awards more than $1 billion in grants a year to scientists at university and state and local governments across the country. The EPA’s analysis indicates that board members received $77 million in competitive grant money over the past three years, something many people would think indicates they are Good at Science. So who will lead us to the scientific promised land now that those EPA-funded scientists have been excluded? Aside from you and me (I’m assuming you aren’t an EPA-funded researcher and if you are, I’m sorry), a whole lot of folks who typically rely on private sources of funding (or as the directive likes to call them, people with “fresh perspectives”). In many cases, that includes the very industries the EPA is supposed to be regulating to safeguard human and environmental health. If these people have their way, they’ll be leading us to a promised land of fringe science and air and water clogged with smog and toxic chemicals. Pruitt announced that Michael Honeycutt, who heads Texas Commission on Environmental Quality’s toxicology division, will now lead the EPA’s Science Advisory Board. He is a scientist at least, so good job there. But his views are extremely outside the mainstream. In 2012, Honeycutt told the U.S. House Science Committee with a straight face that “some studies even suggest PM (particulate matter) makes you live longer.” This statement ignores the vast preponderance of evidence that shows otherwise. It might serve Honeycutt well to read up all about PM’s negative health impacts on the EPA’s page dedicated to them. Hell, you may want to read it before Honeycutt starts advising the EPA, which has already shown a penchant for deleting information that’s inconvenient. TERA is a group that collected 30 percent of its funds from for-profit sources last year and “has been paid by chemical companies for research and reports that frequently downplayed the health risks posed by their compounds” according to the New York Times. Denying climate science is a bonkers proposition, but denying that smog is bad for you is seemingly unfathomable. But because it is 2017 and because Trump is president and Scott Pruitt heads the EPA, this is where we are. “The Trump EPA is stacking the nation’s premiere science advisory bodies with industry reps and conservative state officials who are not nearly as expert as the purged scientists,” Walke said. The rest of the advisory boards will be announced in the coming weeks. A list leaked to E&E News shows that the boards will include members from fossil fuel companies, a chemical trade group, and red state governments according an analysis from the New Republic. Pruitt claims this is all in the service of “sound science” and “back to basics.” But there’s nothing sound or basic about installing people who shill for industry in positions that let them have a say about rules affecting said industry. While Trump’s other cabinet appointees have generally bumbled through their jobs, Pruitt has been uniquely aggressive in turning his agency into a rubber stamp for industry. “The Trump EPA’s continued attack on science will likely be one of the most lasting and damaging legacies of this administration,” Senator Tom Udall (D-NM), said in a statement following the decision. This post has been updated to include comments from Christine Todd Whitman.